This angular art deco icon on Miami’s famous South Beach strip has attracted A-listers, from Madonna to Prince, since it was conceived by Ian Schrager and Phillipe Starck in the 1990s. Credited as the first boutique party hotel, it’s still the place to see and be seen, known for its palm-fringed infinity pool – often voted the most beautiful in South Florida – as well as its private beach and spectacular spa. 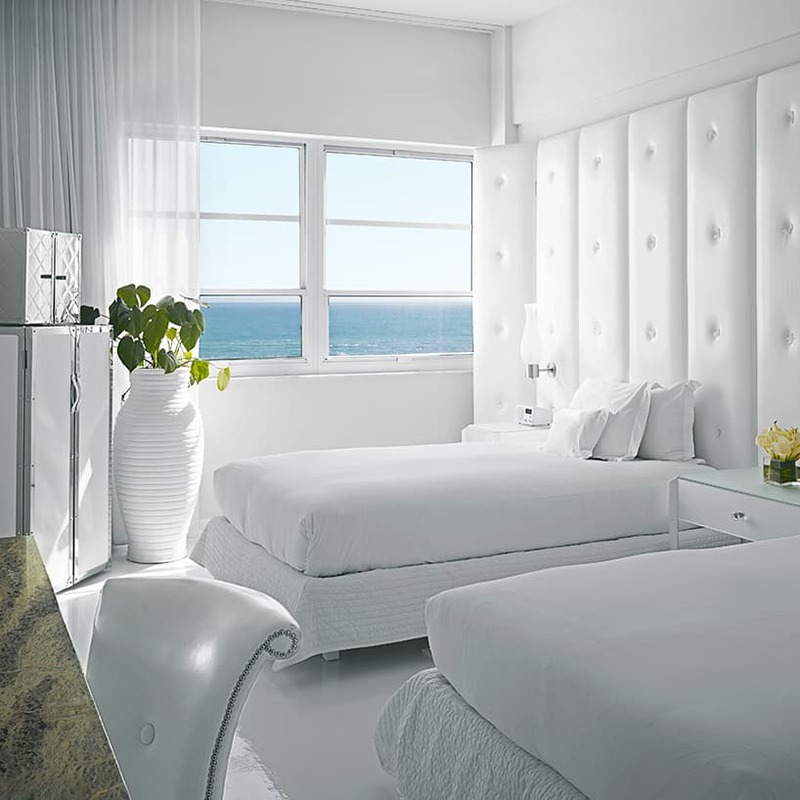 The Delano sits on the ocean front, just one block north of Lincoln Road, a popular shopping and dining street. It’s prime South Beach real estate, surrounded by the most photogenic and historic art deco architecture. Hidden discreetly behind a row of tall trees, pulling up to the entrance of this landmark property I sense an electricity in the air. The lobby is vast, cool and dimly lit. High ceilings, columns and billowing gauze curtains separate the space into a series of exaggerated artistic vignettes. Oversized furniture and surrealist art have an Alice in Wonderland-like quality. Walking through to the back of the hotel is a feast for the senses, accompanied by art from Dali and Gaudi, mellow club beats and scented candles. I pass a sculpture of a giant melting handbag (a la Dali); an eye-catching transparent grand piano (gifted to the hotel by musician Lenny Kravitz); and a pyrex portrait of fashion designer Karl Largerfeld. A sleek sushi and sake bar juts out at an angle, with elegant high stools and enticing plates of sashimi and rolls being prepared. The ornate Rose Bar follows: decadent, lavish, yet private, it’s outfitted with magnificent Venetian glass chandeliers. I approach the double doors to the pool at the back of the hotel and the music begins to build as the Floridian sun flashes through the door. I step outside and the journey continues. Passing through the restaurant, ahead is a green lawn, hammocks dangling from the palms. Beneath the impossibly blue Miami sky, the turquoise pool shimmers. Luminous bougainvillea hangs from every building, and a floral scent clings in the humid air. At the far end of the pool a silver table and chairs appear as though to float in the water. An oversized chess board is ready to be played. These surrealist touches are stylish rather than silly; intriguing and transportive. Rooms in the main hotel are modern and cooling, with white-on-white furnishings. Some have ocean views that are second to none, but if you’re a light sleeper or simply looking for somewhere spacious, opt for the poolside bungalow villa. 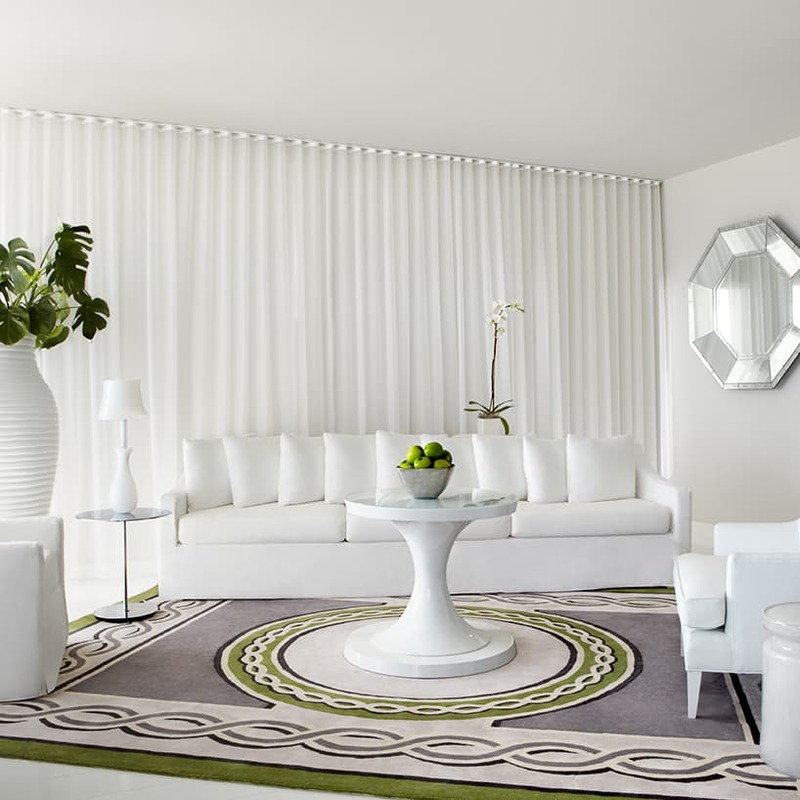 The crisp white decor extends here, across two floors, offering a sanctuary that exudes luxury in every detail. Upstairs, the master bedroom features a super king bed, against a white leather panelled wall. Hand-felted rugs and oversized plants add the only pops of colour to this minimalist aesthetic. The bedroom opens onto the upstairs terrace. With loungers and a table and chairs it’s here we eat our meals, shaded by vines and bougainvillea. It’s an excellent spot for people-watching. The bathroom, with Ciel Reserve bath products, is a showstopper, with an enormous Roman-inspired soaking tub and rain shower in moss green Connemara marble. Follow the spiral staircase downstairs to the living/dining room for plush white sofas, a state of the art entertainment system and fully stocked drinks cabinet and bar. Double doors open onto a downstairs patio with day beds, tables and chairs looking onto the pool and orchard. Agua, the rooftop spa, is a soothing retreat, offering 360 views of beautiful South Beach. Its signature treatment, the milk and honey massage, is sublime. Along with a traditional spa menu, it also offers preventative ageing procedures. All this relaxation can work up an appetite and Leynia, the hotel’s destination restaurant, occupies a sweeping balcony overlooking the pool. It’s an Argentinian-Japanese fusion grill, and each night a large BBQ glows in the grounds as a team of chefs cook up specialities like churrasco skirt steaks and crisped crepe cones filled with smoked salmon, caviar and wasabi. Breakfast is a simple continental spread, but the a la carte choices are creative and delicious – try the French toast stuffed with guava dulce de leche for the ultimate indulgence. Miami, and in particular South Beach, can bring with it a frenetic, if not infectious, energy. Staying in the Delano’s bungalow offer an oasis from the action, while knowing it is, quite literally, only a few steps away.